(NaturalNews) While Americans were bustling about in preparation for their weekend, President Barack Obama quietly signed a bill late Friday afternoon that will likely forever keep people in the dark about the presence of genetically modified organisms (GMOs) in their food. Drafted by Senate Agriculture Chairman Pat Roberts, R-Kan., and ranking Democrat Debbie Stabenow of Michigan, the legislation gives food producers the option to disclose GMO ingredients through digital codes, instead of the mandatory, on-package labels called for by 90 percent of citizens. Consumers wishing to learn about GMO ingredients will have to use smart phones to scan a barcode on food packages that reads: "Scan here for more food information." The percentage of GMOs in a food product that requires QR code labeling will be decided by the future Secretary of Agriculture. Arguably, the most devastating component of the faux GMO-labeling law is that it effectively overrides existing (and genuine) labeling laws in various states such as in Vermont, Maine and Connecticut. The bill indefinitely bars Americans from their right to vote at the state level in the future for any sort of mandatory GMO-labeling. Under the law, it's possible that genetically engineered salmon will not be labeled as such in Alaska. More than a decade ago, the state became the first in the nation to pass a GMO-labeling law, requiring genetically engineered fish be "conspicuously labeled to identify the fish or fish product as a genetically modified fish or fish product," applying to both packaged and unpackaged products. Many believed that Alaska's labeling law paved the way for other states to enact similar legislation – and it did – that is until the federal government gave in to industry pressures. Although GMO salmon is not yet on the market, advocates fear that once it is available, it won't be labeled. "What we've been told is that if these genetically engineered salmon are out on the market, those who are marketing these salmon can voluntarily label them," said Senator Lisa Murkowski R-AK. "Well let me ask you, who do you think is really going to voluntarily place a label on something that says, 'This is not the real thing. This is not your wild Alaska salmon. This is a genetically engineered species?'" The legislation signed by Obama is a huge win for the food and chemical industry. Never again will they have to spend large sums of money defeating labeling at the state level, as was done previously in California, Colorado, Oregon and Washington – where hundreds of millions of dollars were spent by Big Food and Big Ag. Never again will they bear the responsibility or fear of having to place on-package GMO labels, which would have surely caused substantial losses in revenue. The biotech industry will also be exempted from labeling gene edited foods, which just like GMOs are altered to withstand noxious herbicides that would normally result in plant death. 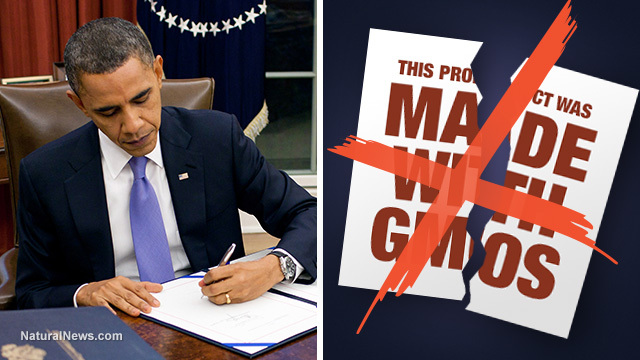 Obama's decision not to label GMOs highlights the false promises routinely made by candidates on the campaign trail. "Here's what I'll do as president. I'll immediately implement Country Of Origin labeling because Americans should know where their food comes from. And we'll let folks know whether their food has been genetically modified because Americans should know what they're buying," said Obama while campaigning in 2007. But instead Obama perpetuated the conflict-of-interest between powerful industries and government regulators, appointing a former Monsanto executive as the head of the Food and Drug Administration. Rather than labeling GMOs, Obama made it so they may never be transparently labeled. "I don't know what kind of legacy the president hopes to leave, but denying one-third of Americans the right to know what is in the food they feed their families isn't one to be proud of," said Andy Kimbrell, executive director at the Center for Food Safety. "This law is a sham and a shame, a rushed backroom deal that discriminates against low-income, rural, minority and elderly populations. The law also represents a major assault on the democratic decision making of several states and erases their laws with a vague multi-year bureaucratic process specifically designed to provide less transparency to consumers." Avoid GMOs altogether by growing your own organic veggies in the Garden Tower, a vertical grow box that produces healthy food without the need for chemical fertilizers. The Garden Tower allows you to grow up to 50 food-producing plants in about four square feet of space – making it the perfect solution for urban dwellers.